Hugh Jones, 79 year old Woodward resident, died Wednesday, November 21, 2018 in Woodward. Funeral services will be held at 10:00 am Tuesday, November 27, 2018 in the First United Methodist Church with Reverend Mary Davis officiating. A private family burial will be held. Arrangements are under the direction of the Billings Funeral Home in charge of arrangements. Hugh Raymond Jones was born on March 16, 1939 in Denver, Colorado; he was the son of Hugh C. and Grace (McCreight) Jones. Hugh attended Woodward schools and graduated from Woodward High School with the class of 1957. He attended the University of Oklahoma, where he received his Bachelors Degree. Hugh then began working in the banking industry, first at Fidelity National in Oklahoma City, then The Bank of Woodward. He was united in marriage to Louise Charmasson on March 2, 1982, they made their home in Woodward. 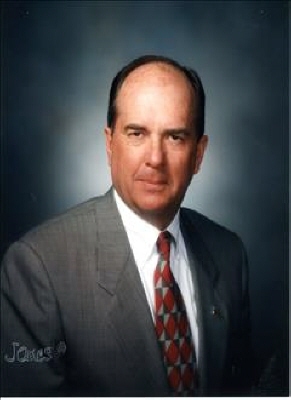 Hugh spent his entire working career in the banking industry, retiring as Bank President from Central National of Alva. Hugh was very active in serving his community and country. At a young age he served his country in the United States Army Reserve. During his working career he was active in the Woodward Elks Lodge, Rotary Club, Woodward Chamber of Commerce, Woodward Hospital Board, Woodward Industrial Foundation, Plains Indians and Pioneer Museum Board, and was named Woodward Citizen of Year. He also enjoyed hunting, traveling, spending time with family and friends, and his dogs were a very important part of his life. He was of member of the First Presbyterian Church. Hugh is survived by his wife Louise Jones of the home; children and grandchildren; Mike Jones of Woodward; and his children; Tyler Jones and family; Nicole Jones and Ryan Kemper; and Zachary Jones; Hilary Jones Lewis of Tulsa; Kirby McBroom of Elk City and their children; Staton McBroom; and Grant McBroom; Steven Stewart and wife Trista of Truth or Consequences, New Mexico; and their children; Bailey Merino and husband Cristian; and Lane Stewart; Walker Jones of Dallas, Texas; and his children Cole Jones; Brennan Jones; and Christopher Jones; beloved daughter-in-law; Kelly Stewart of Woodward; other family and many friends. In lieu of flowers memorial contributions may be made to the First Presbyterian Church with the funeral home accepting the contributions. To send flowers or a remembrance gift to the family of Hugh Jones, please visit our Tribute Store. "Email Address" would like to share the life celebration of Hugh Jones. Click on the "link" to go to share a favorite memory or leave a condolence message for the family.